This is Elaine's wedding dress. The four major differences are that she won't wear gloves, she'll have straps, she'll remove the crystal button (see below), and she'll be smiling and happy (doesn't this bride look depressed?!). The dress is made by Da Vinci Bridal. 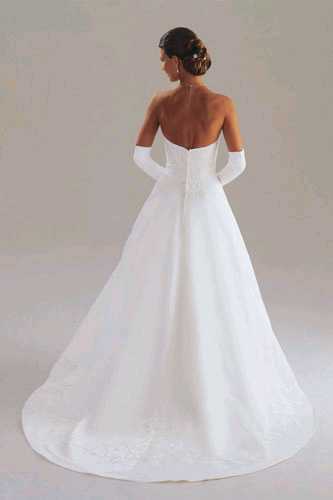 It has a satin bodice with embroidery and beading, an A-line skirt with indigo panel, and a crystal button. However, Elaine thinks the crystal button is tacky and it will be removed. Otherwise, this is the dress! The embroidery on this dress is absolutely lovely. To really appreciate this dress, you have to see it... and you will if you show up at the Ramada Inn in Bangor on 21 August 2005! Elaine got her dress through the House of Brides (93 Central Street, Bangor, Maine, near City Hall). We encourage you to visit them at www.MaineBrides.com. To see what the maid of honor and bridesmaids will be wearing, visit the Wedding Party Outfits page! will look like in the dress and tux? wearing their wedding attire together!